Of late American readers have been well served by a veritable cottage industry of works about the Roman Republic and Empire, and their respective falls, and various aspects thereof, and what lessons we, with our republic (or empire, as some would have it), purportedly at the precipice of analogous fiscal, ecological, military, social and/or political Seneca Cliffs, might learn from them. History may not repeat itself any more than we can wade into the same river twice, but, of course, we can step into rivers that look more than a sight familiar. Sometimes a nicely behaved riverlet's dub it the Goth Swanturns of a sudden into a drowning horror. Indeed, a close reading of Roman history does suggest, in blurriest outlines, some analogies with contemporary trends and conundrums. But there are perhaps more valuable insights to be parsed from our own little-known and, relatively speaking, recent history. 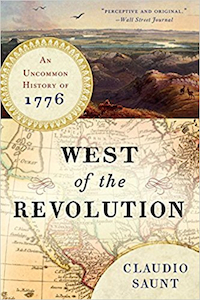 In West of the Revolution, Claudio Saunt, a noted scholar of early American and Native American history, spotlights nine places and formative events of 1776 that rarely raise a blip on the radar of even the most well-educated Americans. As Saunt writes in his introduction, "The American Revolution so dominates our understanding of the continent's early history that only four digits1776are enough to evoke images of periwigs, quill pens, and yellowing copies of the Declaration of Independence." As for knowledge of what was going on west of the Appalachians in 1776, I can speak for myself, lo, many a decade ago, when I was a recent graduate of the University of Chicago. History out there west of the Appachalians had seemed to me then... like, totally vague. I'd heard of some of the tribes, those ones with interesting headgear, mainly from watching TV. Since I grew up in California, I had seen some of the Spanish missions. These had had struck me as absurdly drab and morbid. I was not Catholic, and the Spanish were well and gone, as were those Indians, I assumed. In elementary school, when we got our dose of state history, I must have been told the name of the local indigenous peoplethe Ohlonebut by the time I graduated from college, for 64,000 dollars, I could not have come up with it. Had I known the term terra nullius, I might have used it. In the intervening years I had the opportunity to remedy my ignorance of California's indigenous and mission history; perhaps the more for that, I found Saunt's masterful historical narrative so rich and riveting. "Between the continent's far edge and the Appalachians stood thousands of towns and villages, whose millions of residents spoke diverse languages and belonged to a multitude of nations. On the eve of the War of Independence, even the most fervid of American speculators could not imagine the extraordinary events unfolding in the West." The events Saunt describes were indeed, extraordinary, and "in surprising ways," he writes, "as pertinent to the twenty-first century as the better-known history of the American Revolution." "Each year, thousands of pelts from the Aleutian Islands and millions from Siberia funneled into Irkutsk. The scale of the vast warehousing operation was out of proportion to anything the Aleuts could have imagined. In Irkutsk, the furs were sorted by quality and the best sent on to European Russia. The others [for the Chinese market] were floated across Lake Baikal to the mouth of the Selenga and then upriver to Kyakhta." "Sea otter and beaver pelts, orginating in North America, had traveled in opposite directions around the world-nine thousand miles east or forty-five hundred west-only to converge at a remote outpost ... From there, they were carried away on the backs of camels or in two-wheeled carts drawn by oxen, destined for Chinese royality in Beijing." Did those Aleuts see Kyahkta? Did they see a camel? Could they picture a Chinese princess in her fur-trimmed silk robe? Given the limits of their language's vocabulary, not to mention what must have been the bizarrerie of crude translation from the Russian, could the Aleuts have begun to fathom the scale, the scope, the money, the powercould they have but begun to grok but an inkling of the tremendous systemic implications in all of this? (Can we?) We only know that the Aleuts were not far from Kyahkta, presumably on their way there, when they died in Irkutsk, presumably in 1776, of smallpox. The Spanish, in 1776, were worried. Already the Russians were calling the northwest coast of North America "New Russia." How far south would they venture? From previous exploratory expeditions the Spanish knew of the three excellent natural habors that lay north of Baja California: San Diego, Monterey, and San Francisco. If the Russians took those, they could dominate the Pacific, and so imperil the Spanish lifeline of trade with China (the famed Manila Galleons out of Acapulco, trading Mexican silver for silks, spices, and more). Meanwhile, the Franciscans, zealous to save souls for Paradise, lobbied to push north from the deserts of Baja California, to establish missions in more populated and better-watered lands along the Pacific coast. And so as the King in Madrid and his Viceroy in Mexico City commanded, in 1769, Franciscan missionaries under Father Junípero Serra, with soldiers, started moving into what they called Alta California (today the state of California). Further north, in the San Francisco Bay Area, in March of 1776, what is now Silicon Valley was the scene of first contact, in all its shock and confusion. It was also the year that Mission Dolores, now nestled in the shadows of San Francisco's skyscrapers, was founded. As archaeologists have discovered, in the pre-contact San Francisco Bay Area the indigenous peoples were already pushing hard against their resource limits. Saunt cites evidence of overhunted game and fish, increasing dependence on the labor-intensive acorn as a nutritional staple, widespread childhood malnutrition, and violence. After the arrival of the Spanish, with their disruptive mission system, animals and diseases, writes Saunt, "the demographic collapse that followed was swift and terrible." In California the missionaries' modus operandi was to bring the Indians into the mission and punish any who tried to leave. Yet producing enough food was a challenge greater than the missionaries could manage. Bringing provisions by ship proved too expensive and risky. To support the California missions, therefore, the Spanish determined to establish an overland supply route from Santa Fe, New Mexico (which in turn, was already linked to the cities of the Mexican heartland by the Camino Real de Tierra Adentro). On July 4, 1776, a scouting expedition known as the Domínguez-Escalante, after the two Franciscans who led itset out from Santa Fe. Madrid and Mexico City may have had their cathedrals and palaces, but in 1776, Santa Fe was little more than a huddle of abobes. It was also fragile, still, nearly a century later, recovering from the Pueblo Revolt of 1680, and beleaguered by the Apache and the Comanche. From Santa Fe, the Domínguez-Escalante Expedition zigzagged northwest over the high desert of the Colorado Plateau, a terra incognita that we know today as the Four Corners region, where the states of New Mexico, Colorado, Utah, and Arizona meet. The men crossed the Great Basin. They encountered Paiutes and Utes. It was a brutal march, beset with confusions, arguments, starvation and thirst. Their last guide had abandoned them when, on the edge of the snow-blanketed Great Basin, out of food, and with only the murkiest (and mistaken) notion of what still lay between them and the California coast, they turned around. They arrived back in Santa Fe on January 2, 1777the day General George Washington withdrew, after his breakthrough victory, from Trenton, New Jersey. The fruit of this otherwise failed Domínguez-Escalante Expedition was the map completed two years later by one of its members, the artist and cartographer Bernardo de Miera y Pachecoa name that tinkles few bells outside the precincts of Southwestern history aficionados. But Miera's map of wonders was a wonder in itself. If much of it was wishful guesswork and interpretations, many of them faulty, of what indigenous guides had told him, the man himself, as expert a mapmaker as might have been found in the Americas of his day, had trekked through hundreds of miles of these lands, he had seen strange peoples, strange animals and birds, and he had seen mountains, canyons, rivers, lakes, basins, and fantastic geological formations, all previously unknown to anyone other than the indigenous people. "Nearly three feet wide and more than two feet high, it charts over 175,000 square miles... Like other cartographers of the time, Miera inherited the medieval tradition of creating 'visual encyclopedias of the world,' and his map is bursting with illustrations, symbols, and narrative legends." The Spanish jealously guarded such intelligence; nonetheless, Miera's map was copied and that copy consulted by Thomas Jefferson and Zebulon Pike, the early 19th century explorer. As Saunt argues, Miera's map was "one of the most influential maps in American history," for it "helped shape the geographic imagination" of the United Statesa country born in Philadelphia in the same year of that expedition. And that new nation was, already, in 1776, "intent on extending its sovereignty to the shores of the Pacific." The contest for the continent west of Santa Fe was on. There would be ferocious resistance from the peoples already theremany of them, too, fighting one another, as they had for generations, over grievances old and new, and especially for hunting and fishing grounds. Some tribes were as cousins, speaking the same language, or a related dialect; others spoke tongues and had customs as different from one another as Sardinians and Swedes, or, say, Belgians and Bulgarians. Having introduced the English colonists' hunger to press past the Appalachians, Russia, Spain, the newborn United States, Aleuts, indigenous Californians, the roaring engine of the international fur trade, and a map, Saunt's tour of 1776 then whirls us back to 1763 and across the Atlantic to the Continental Dividethe opening for the second half of his book. Saunt refers not to the geological divide of North America, but "this enormous North American land transaction," as if the continent were a Brobdingnagian buttercream, divvied up by so many knives and spatulas of solemn words and seals, by the European ambassadors congregated in Paris, after the Seven Years War. With spare but charmingly novelistic description, Saunt evokes 1763 in Paris: Aristocrats gambling, a ball in the Spanish ambassador's palace, and then the meeting in the Duke of Bedford's residence where, "under crimson draperies and a portrait of Britain's King George III," the treaty was signed. As for North America, in broad strokes, with the noted exception of New Orleans, Louis XV was out. His cousin, Carlos III of Spain, took the continent west of the Mississippi River; and from the east of the Mississippi to the Atlantic, dominion was now all George III's. Writes Saunt, "On the face of it, the claims of European monarchs to vast North American domains were absurd... Yet for local residents, the massive land transaction had very real consquences with complex and varying ramifications that took decades to unfold." Returning to his rhetorical device of funneling the narrative through the year 1776, Saunt proceeds to spotlight four of these "very real consequences." Firstly: In central Canada, with the oceanic prairielands newly claimed by the British, their Hudson Bay Company has moved inland to establish Cumberland House, a stunningly remote trading post, in winter, beset by jaw-locking cold. The Hudson Bay Company aims to defend its monopoly on beaver peltsthat monopoly quickly eroding with the influx of independent traders, many French but now with British backing. Over the previous century, Europeans had adopted various styles of beaver-fur and beaver-felt hats, from the high-crowned and broad-brimmed Elizabethan courtier's, to the French-style cavalier's slouch hat with plume, then, by 1776, tricorn hats, and (this the style Benjamin Franklin favored) rustic fur caps. On the supplying side, Cree and Assiniboine trappers demanded rum, textiles, tobacco, and guns, gunpowder, and shot. "Before the arrival of Europeans, it is estimated that there were between sixty million and four hundred million beaver industriously damming rivers and constructing lodges in North America. By 1900, the animals were nearly extinct." This near-extermination of the beaver may have had ecological consequences so huge and systemic that they may prove impossible for us, for all our modern science, to fully grasp. In building dams, Saunt explains, this large rodent becomes a "geomorphic agent." "The dams, made of alder, aspen, thicket, leaves, mud, stones, and other debris, can be enormous, regularly stretching 225 feet across with a thickness of six feet. One dam in Montana measured an astounding 2,300 feet. Another rose 16 feet high. In favorable environments, there may be as many as thirty dams per mile of stream, and up to 40 percent of all streams may be modified by the obstructions." One of many effects that "cascaded through Canada's boreal forests in the eighteenth century" was the plaguing blackfliesfor, as beaver dams collapsed, wetlands drained and water began to run swiftly. Blackflies prefer that. Secondly: Some 800 miles south, in what is now western South Dakota, in 1776, Standing Bull arrived in the Black Hillsa sacred place and a founding event in the history of the people known as the Lakota Sioux. Standing Bull had led his people west from their homelands in what is now Minnesota. One reason they had pushed over the Missouri River and the plains was to hunt the bison; another, less understood, was that Pontiac's War had cut off vital trade goods from the east. By that 1763 Treaty of Paris, the British had taken the French territories around the Great Lakes and in Ohio country. The French had not governed there with absolute authority; they had long given the indigenous peoples generous scheduled gifts. In other words, they paid tribute to the Indians. Writes Saunt, "European armies were no match for native peoples in this part of the world." The new British governor, Jeffrey Amherst, refused to give the customary gifts; this enraged the Delawares, the Miamis, Mississaugas, Ojibwas, Senecas, Shawnees, and Ottawas, and soon the British found themseves embroiled in that war named for a chief of the Ottawa. "Looking east from the Minnesota River, Pontiac's War appeared a lot different than it did looking west from Manhattan Island. Where Amherst saw an unjustifiable challenge to British power launched by treacherous savages, Standing Bull's people identified a grave threat to their access to Atlantic trade." In a fascinating section, Saunt details the indigenous trade networks west of the Mississippi, "a hub-and-spoke system, formed not by airlines but by footpaths, horse trails, and river routes." In 1776 there were three main centers: Taos in New Mexico; the Dalles, a series of cascades on the Columbia River in present-day Oregon; and on the Missouri River in what is now South Dakota. The latter, which became of increasing importance to the Sioux, was situated "at both the eastern edge of the Plains Indian horse market and the western edge of the European gun trade." A third consquence: In Spanish territory west of the Mississippi, in what is now central and western Missouri, "the heart of the continent," 1776 found an empire expandingthat of the Osages, who had arrived "perhaps migrating from the Ohio River," and with guns. By this time the Osages dominated the fur trade with St. Louis, and they were "stealing Indian women, kidnapping children, and rustling horses and mules." European law held little sway in this frontier zone, the wild west of its day, filled with, writes Saunt, "deserters, robbers, rapists, and murderers. By trading with any and everyone, they freed native residents from Spanish dependence and underwrote Osage expansion toward the Red River." The French, then the Spanish, could not control smuggling up, down, or across the Mississippi River any more than could the English. And the Osages, suddenly by that Treaty of Paris surrounded by new trading partners, played the one against the others, to their own advantage. At the time of the signing of the Declaration of Independence in distant Philadelphia, the Osages were about to "double the size of their empire, adding one hundred thousand square miles to their domaina rate of expansion equal to that of the thirteen colonies and United States over the same period." In the nineteenth century, the Osages suffered many tribulations. Nonetheless, they retained what turned into an important asset: mineral rights on Oklahoma oil fields that to this day generate tens of millions of dollars in annual royalties. Writes Saunt, "The Osages had not forgotten the lessons of the eighteenth century." Fourthly, and finally, Saunt takes us to 1776 in the Deep South, and the saga of the Creeks, a people who, by that Treaty of 1763, suffered a very different fate. They had held large swaths of present-day Alabama, Florida, and Georgia. The coastal plains and pine forests were rich lands for hunting, gathering, fishing, and for growing corn. Creeks had some thirty villages each with "a central square, a council house, and numerous dwellings made of posts, wattle, and mud." But instead of gaining trading partners, the Creeks lost their Spanish and French partners; the treaty left them surrounded by the British. Creek lands were not for the Spanish to give to the British, they said, as to the wind; British settlers began to move in, making it increasingly difficult for Creeks to hunt deer, the skins of which they traded for cloth, beads, and guns. And here, too, while the French and Spanish had given them gifts, the British refused. Worse, the British began trading guns to the Creeks' enemies, the Choctaws and Chickasaws. Then British Georgia and Florida embargoed the Creeks. In desperation the Creeks attempted to turn to the Spanish: From the Florida coast, a group of Creeks sailed on a fishing boat to Havana, Cuba. By 1776 Creek embassies had appeared in Havana at least nineteen times. What the Creeks could offer the Spanish was dried meat; what they wanted from the Spanish were, urgently, guns, powder, and shot. But the Spanish gave them only "stacks of hats, mirrors, and thread and professions of 'paternal affection.'" Then the war between the British and their American colonies caused Creek trade opportunities to further shrink. Things might have been different. As Saunt explains, Cuba was then a burgeoning slave economy producing sugarcane and aguardiente; it needed more food, and the Creeks could have helped provide that. In 1776 in a drunken fight over a woman, a Cuban boatman stabbed three of his Creek passengers. In fear of revenge, Cuban boatmen steered clear of the Creeks on the Florida coast. Marooned economically and politically, the Creeks continued losing ground. Their territories were swiftly encroached upon by slave-worked plantations of rice, tobacco, sugar, and cotton. In the next century, along wth several other tribes, the Creeks would be forcibly removed, walking the Trail of Tears to a reservation in Oklahoma. "What if the Creeks had become purveyors to the fastest-growing slave colony in the New World? Would they have had the economic clout to avoid removal in the 1830s and retain their homelands? Would their nation have become a part of the Confederacy in some form, perhaps as a member state that shared the Old South's deep investment in slavery? How might the South and American history have been transformed?" In the United States, for the most part, our pre-Revolutionary history west of the Appalachians has been a matter left to academic specialists and local and Indian history enthusiasts. Saunt's West of the Revolution is an at-once engaging and compelling corrective, and more: these nine places and formative events suggest fresh ways of looking at our own times, and at the power by which trade, migration, technological change, ecological change, epidemics, and the gusts of fashion and sheer, crazy luck may impel us, or, beneath our full awareness, subtly nudge us, in strange directions. Above all, West of Revolution allows us to begin to perceive how these peoples of our own past were, to quote Saunt, "entangled in a web of environmental, political, and economic relationships that they could neither fully control nor completely understand"as are we. Writes Saunt, "we are unavoidably and always interdependent."